Holy basil n apple detox juice. Few days back I had it at my friends place after our morning walk. I really liked the subtle but dense flavored juice. I really liked this idea of having a healthy juice instead of tea, coffee or milk early morning. I gave it a little twist by adding fresh ginger and one small tomato. The taste was amazing and zingy indeed. 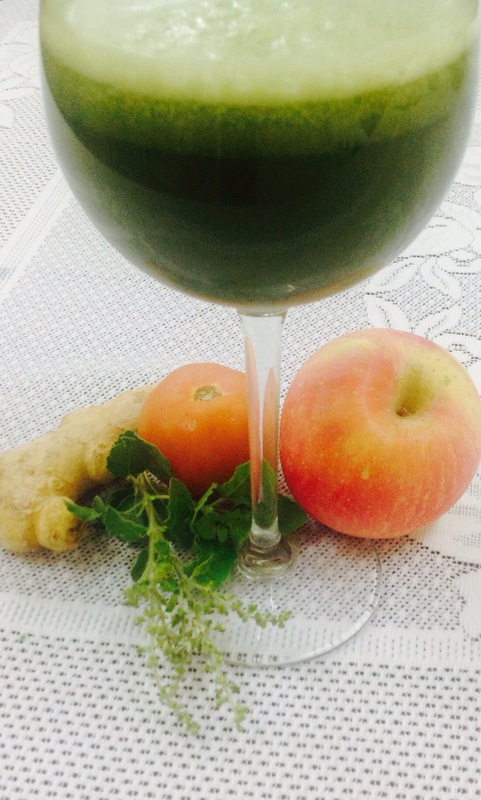 If you are looking for healthy juice to start your morning instead of cofee, tea or milk than please check this recipe. 1- Wash all fruits n veggie very well and chop in big chunks. 2- In a mixi pot put all things. 3- Blend till very well paste forms. 4- Strain n squeeze very well and drink immediately. 5- Bets thing is no need to add salt or sugar or honey to it. As it is quite flavorful. Vada with sarson n methi saag twist! Whole wheat flour veggie puffs!